Robin O’Neill was looking forward to her dream destination wedding in Mexico when her older brother, Vannarin “Vann” Ly, learned his stage IV colorectal cancer became resistant to treatment. 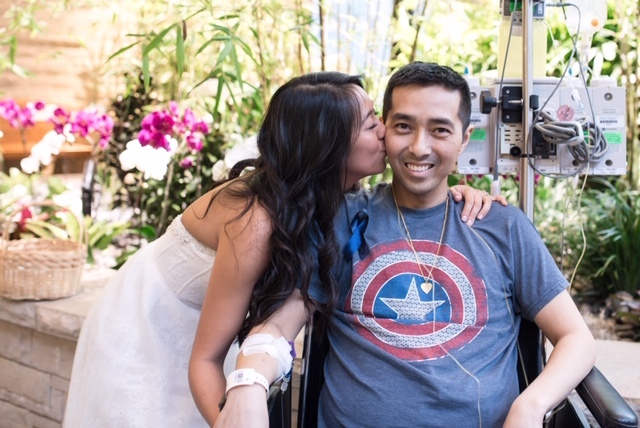 His doctor, Kimmie Ng, MD, MPH, director of Dana-Farber’s new Young-Onset Colorectal Cancer Center, told the family that Vann likely only had weeks left to live and for Robin that meant one thing: making a new destination for her wedding—her brother’s hospital room. With the help of Dana-Farber staff, planning for her new wedding happened over just four days. Luckily, Robin’s fiancé, Sean, was on board and ready with the rings. “The most important part of my wedding was always that my brother was by my side,” said Robin. The communities came together to ensure just that—to make Robin’s day as special as she had always envisioned. On March 4, 2018—during colorectal cancer awareness month—Robin and Sean were not married in Vann’s hospital room as they had planned, but in Dana-Farber’s Thea and James Stoneman Healing Garden, a calming space Robin had often visited during Vann’s treatment to find peace and clarity. “When you are in the Healing Garden, you don’t feel like you are in the hospital anymore,” said Robin. This was particularly true on Robin and Sean’s wedding day. Donated flowers adorned the space, complementing the already lush greenery, while a volunteer harpist played soothing melodies in the background. A photographer volunteered time to ensure that Robin and Sean will never forget a moment of their wedding day. 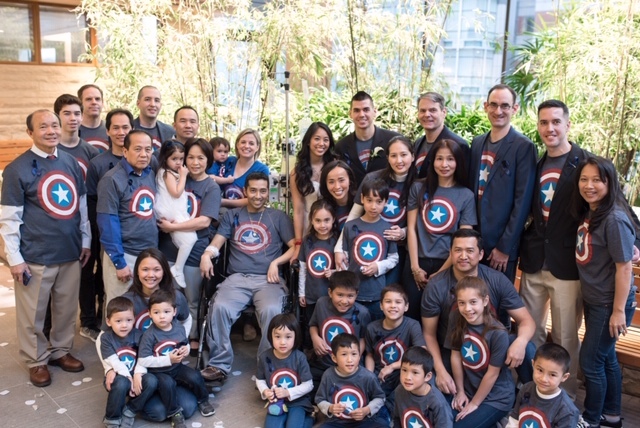 As a surprise for Vann, wedding guests sported Captain America T-shirts, just as Vann had during every chemotherapy treatment. Captain America had become a symbol for Vann’s battle and Vann was fondly referred to as “Our Captain America” by family and friends. Vann passed away just a few weeks after Robin’s wedding. Following his death, Robin used Crossfit as an outlet to deal with her loss. She credits the exercise program and the community she found at her local gym with helping her put her life back together. This community also helped her continue Vann’s fight. On March 24, Vann’s birthday, Robin hosted the “Vannarin Towerball Classic” at her local gym, Crossfit PR Star. This family-friendly event benefited Ng’s research in the new Young-Onset Colorectal Cancer Center at Dana-Farber that could help patients like Vann, who was just 37 years old when he began exhibiting colon cancer symptoms. It took six months, numerous misdiagnoses, and ultimately emergency surgery for a perforated bowel before Vann was diagnosed with stage IV colon cancer and referred to Dana-Farber—too late to be cured. Through this event, Robin wanted not only to raise funds to support leading-edge research, but also to raise awareness that colon cancer is not just an “old man’s disease” and that an increasing number of individuals under the age of 50 are being diagnosed with colorectal cancer. She is confident that research within the new center will lead to better detection methods and treatment options for patients like Vann. Robin is grateful for the beautiful wedding she had at Dana-Farber, but she wants to ensure that, in the future, no destination is out of reach for colon cancer patients.